A drizzly graduation day at Salford University last Wednesday. The sun came out shortly after. And at Bishop Bilsborrow Roman Catholic Primary School, Moss Side, 11 year olds received their prizes also wearing caps and gowns. The idea, originating in the States, came from one of the parents. "We're fed up and going!" has been the response of many people in Manchester to the recently-launched advertising campaign created at a cost of £2.5m by the promotional agency Marketing Manchester, whose chairman is Sir David Trippier. The red and blue logo has been seen on the sides of buses and in newspapers, though the series of brief tv ads featuring Manchester personalities uttering the inspiring words, has been absent from local tv screens recently. The campaign has been challenged by a group of the city's young entrepreneurial people, whose response to "We're Up and Going" has been "You Cannot Be Serious", hence their name: The McEnroe Group. They have come up with a competing campaign which they say projects the image of the city much more effectively than the Marketing Manchester campaign. Ideas and artwork were donated free of charge. The new campaign was launched last Wednesday, and features a ten point shape, the words Made in Manchester and a running theme of "revolution". The ten points of the asterisk, which resembles perhaps, a piece of sheet metal, are said to symbolise the ten boroughs and cities of Greater Manchester. Please, Manchester expatriates, let me know, if you think this series of designer-trendy images projects a clear and recognisable identity for Manchester, or if the spiralling question mark in the website's opening animated gif, is closer to your reaction. Keith Ridding and Robert Boardman, killed in the recent coach crash in France, were buried last Wednesday after a service at St Anne's Church, Clifton, Salford. Their schoolmate Nicola Moore was laid to rest the next day. The driver of the coach, Jim Shaw, is reported to have been deeply shocked by what happened, but the children sent him a note telling him they don't blame him for the accident. They even invited him to come to the school to share in their grieving. The inquiry into the accident, in which the three youngsters lost their lives, is continuing in France. The go-ahead has been given for a £50m development in a former newspaper complex in the centre of Manchester. What used to be "Maxwell House" (pictured right - the name used to be featured in large letters on the double hoarding at the top of the facade), will become an entertainment centre with bars, shops and a multi-screen cinema. 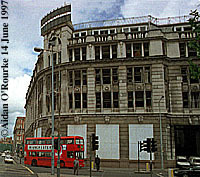 The building, on the corner of Shude Hill and Corporation Street, is lying derelict, and has been like this since it was vacated by the Mirror Newspaper Group several years ago. A clue to earlier times is a sign in the side entrance, currently occupied by parked cars, saying "Horse Drawn Vehicles not allowed". The new development will be called "The Printworks", and is only a short distance from the Nynex Arena, built above Victoria Station, and which also has a new multiplex cinema. Avro International, the plane manufacturer based at Woodford, near Stockport, has secured an order for planes worth more than £370m. The buyer is Minneapolis-based Northwest Airlines, who will purchase 24 new RJ85 aircraft, the first of which will be delivered in May of next year. The deal will secure the jobs of 1500 staff at Woodford, and brings the number of orders for the aircraft to 136. Avro International is a subsidiary of British Aerospace. 50 years ago this week, the Avro aircraft factory was in the news, when a brand new model of the ill-fated Tudor IV aircraft took off on a test flight to South America. And as Central Europe battles with severe flooding, parts of Manchester were affected by rising water levels caused by a blackout storm on Wednesday the 16th of July, 1947. Read about it in Manchester Eyewitness. The last seven days have seen first drizzly weather clearing on Wednesday to bright blue skies and hot temperatures, well in excess of 70 degrees. The stable conditions have been ideal for the various outdoor events which have been taking place. These include an anti-racist event in Albert Square and in other city locations yesterday, the open-air Halle Concert at Tatton Park last night, the Buxton Festival, in full swing all week, and the first ever night time cricket match in progress at this moment under floodlighting at Old Trafford. The good weather is predicted to continue up till next weekend. The picture on the left is of the market and Town Hall, Hyde, taken last Saturday. Please have a look at the website of Euan Kellie, which features many photos showing the bomb damage and subsequent reconstruction, plus newspaper articles.